Call out my name. Your sadness is my sorrow. Make up your mind and the feeling stays inside. No time for pain. No Time to thinks things over. We're living our years of decay. But I cherish all moments each day. The quest for the truth where it lies. All I see is the pain in your eyes. But feelings do not betray. My faith will move mountains. What will it be, wrong or right? You're so close yet so far away. Together alone we will stay. I'll care for you for what it's worth. Untill you will be one with the earth. 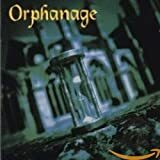 All Orphanage - Inside lyrics are property and © copyright of their respective owners.